Leadership is such a popular topic that for me it is beginning to lose any meaning. Organizations that I respect like Amazon.com use it as core to their hiring practices, just check out their values and Jeff Bezo’s ten leadership principles that never go out of style. Over the years I have spent a ton of time learning and studying the topic, I have The 21 Irrefutable Laws of Leadership by John Maxwell and other books on the topic right next to my desk in the office. Continually I go back and forth with embracing these ideas as a rule of life and going contrarian to the popular thinking. Needless to say I am still learning and somewhat tormented with the concept of leadership. 10 1-2 Then Samuel took a flask of oil, poured it on Saul’s head, and kissed him. He said, “Do you see what this means? God has anointed you prince over his people.“This sign will confirm God’s anointing of you as prince over his inheritance: After you leave me today, as you get closer to your home country of Benjamin, you’ll meet two men near Rachel’s Tomb. They’ll say, ‘The donkeys you went to look for are found. Your father has forgotten about the donkeys and is worried about you, wringing his hands—quite beside himself!’3-4 “Leaving there, you’ll arrive at the Oak of Tabor. There you’ll meet three men going up to worship God at Bethel. One will be carrying three young goats, another carrying three sacks of bread, and the third a jug of wine. They’ll say, ‘Hello, how are you?’ and offer you two loaves of bread, which you will accept.5-6 “Next, you’ll come to Gibeah of God, where there’s a Philistine garrison. As you approach the town, you’ll run into a bunch of prophets coming down from the shrine, playing harps and tambourines, flutes and drums. And they’ll be prophesying. Before you know it, the Spirit ofGod will come on you and you’ll be prophesying right along with them. And you’ll be transformed. You’ll be a new person!7 “When these confirming signs are accomplished, you’ll know that you’re ready: Whatever job you’re given to do, do it. God is with you!8 “Now, go down to Gilgal and I will follow. I’ll come down and join you in worship by sacrificing burnt offerings and peace offerings. Wait seven days. Then I’ll come and tell you what to do next.”9 Saul turned and left Samuel. At that very moment God transformed him—made him a new person! And all the confirming signs took place the same day. Saul had nothing to do with getting into leadership and this flies in the face of popular theory I have studied and the theological concept of servant leadership. Saul was neither a great leader nor a servant, rather Saul’s life (and heart) were consumed by a powerful and living God in order to lead. Even as I write this I know that I should not be surprised as David, the greatest leader ever to live, was nicknamed a man after God’s own heart. God raises up leaders as fit for God’s plans. As a side note it is no wonder that followers of God are admonished to pray for our leaders, if God has placed them there we are to pray whether they are a blessing or a curse to us personally they are part of God’s greater plan. This is key to have in mind during this election process in the United States, more prayer and less banter. Robert Greenleaf, a retired AT&T Executive, championed a similar model of leadership during a time when more authoritarian models of leadership dominated corporate life. In his thin little pamphlet entitled The Servant as Leader, Greenleaf, consistent with his title, wrote not about the Leader as Servant but about the Servant as Leader—a crucial distinction for him. Greenleaf says this: “The servant-leader is servant first… Becoming a servant-leader begins with the natural feeling that one wants to serve, to serve first. Then conscious choice brings one to aspire to lead. That person is sharply different from one who is leader first… The difference manifests itself in the care taken by the servant first to make sure that other people’s highest priority needs are being served. The best test, and the most difficult to administer, is this: Do those served grow as persons? Do they, while being served, become healthier, wiser, freer, more autonomous, more likely themselves to become servants?” Check out the entire manuscript of the sermon here. Personally I will continue to wander through the waters of what it means to lead. I will pray for leaders, I will pray that God will ‘change my heart’, and I will evaluate my life through the lens of whether those I serve are more likely themselves to become servants. This week I met a number of people in person for the first time from my work. It was a great time and to put a face with the voice was amazing. One thing I because aware of after this is that when I read emails from people, I read them hearing their voice in my head rather than my own voice reading it. I was wondering if that is the case for everyone? As you read my blog post is it your own voice that you hear? Do you know me and hear my voice? Or do you not know me and you have made up a voice that you think would be mine if you were to meet me? 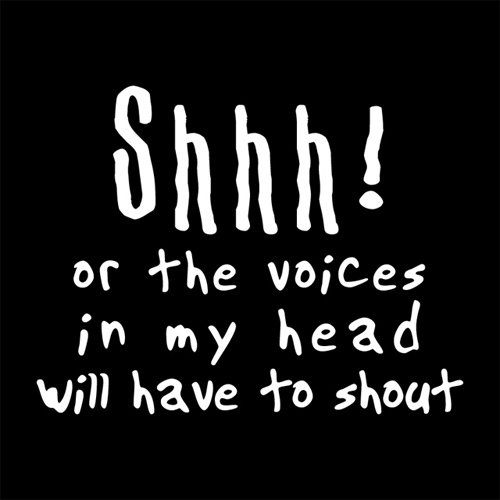 For those of you who are wondering, yes the voices in my head fascinate me.